"Where are you? And why are there hamburger and artichoke stickers everywhere?" "I'm at the Taste Talks awards with Molly! We are drinking an Oreo Black Tap milkshake and eating Earl Grey cotton candy! And those are sugar beets, not artichokes. And they're tattoos! " Can I be honest with you guys? I don't quite remember when I first stumbled onto Molly's blog, or how she and I got to be friends. Maybe it happened because I bought her a hot dog at the Saveur awards last year? I don't really know. All I know is that it seems like I've been reading her blog for forever, and that, these days, it seems that we text each other almost every day. From topics as boring and business-y (like which sponsors are good, and whether blog agencies and virtual PAs are actually worth it), to more ridiculous and hilarious ones (like whether or not she should wear a cape dress to the aforementioned Taste Talks awards, or what kind of Sia themed cake will we finally make, or what it's like to bring our very quiet and very Scandinavian significant others to loud parties), we've got each others backs. She's become a good friend, and is someone I can rely on to tell it like it is and to find the good in every and any situation (and bring sprinkles if necessary). Plus, she wrote a book!!! So I'm a little late to this party, I know, I know. 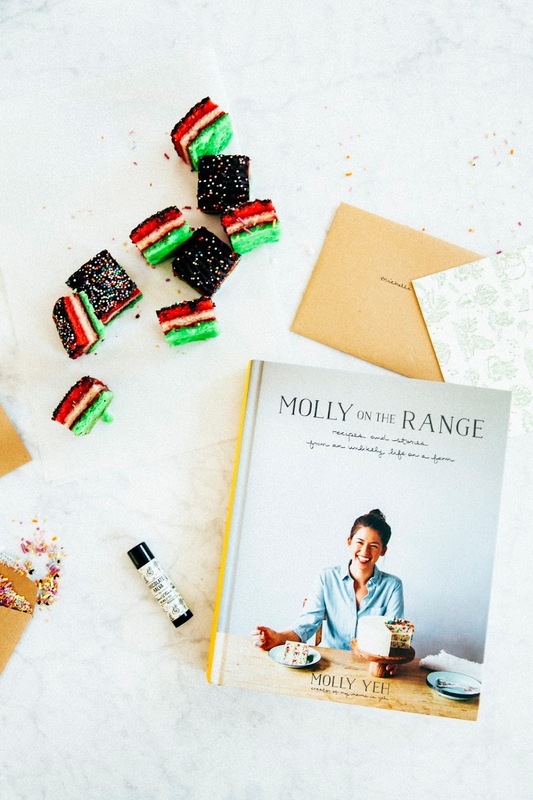 Molly on the Range actually came out at the start of the month but I've been knee-deep in sponsored posts/moving/events and haven't been able to find the time to make something until now. Plus, I didn't even know where to start! Should I bake one of the awesome cakes that she's known for? Or one of the intriguing (and vaguely dirty sounding) savory dishes like meatless balls or a pair of nice buns? I have never lived in the Midwest, so my reaction to "cookie salad" was very similar to Molly's when she first moved there a few years ago and discovered it for herself at a buffet: confusion, fear, then acceptance. 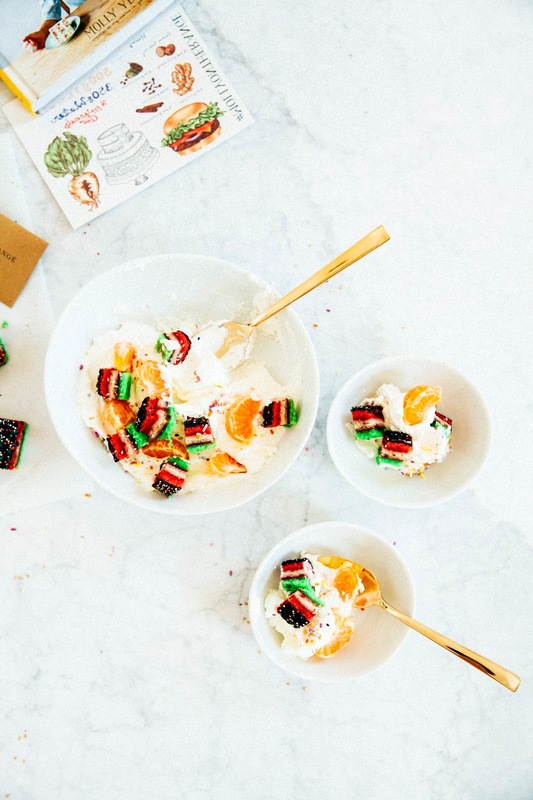 Traditional Midwestern cookie salad consists of a concoction of Cool Whip, pudding, crushed cookies, and mandarin oranges. It sounds weird, I know. I was scared. Erlend was a non-believer. But with Molly reassuring me that it was similar to one of my favorite English desserts, Eton Mess, I persevered. And you know what? It was delicious. 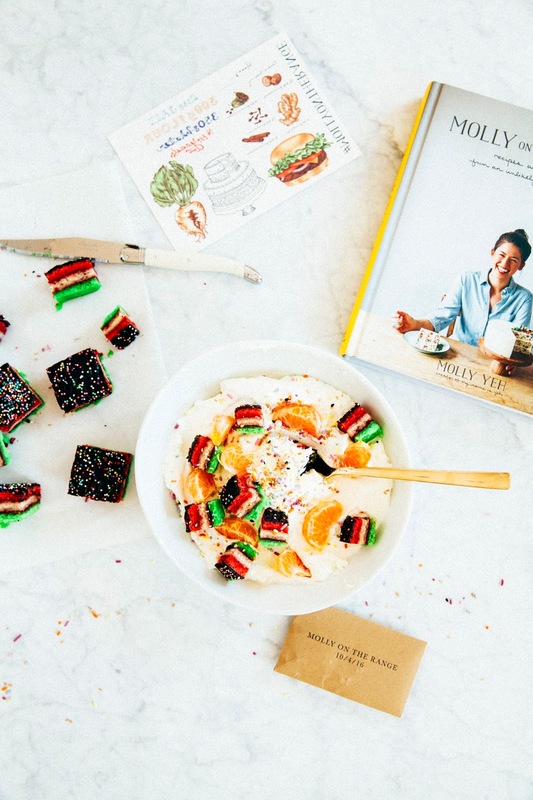 Molly's version uses fancy pants pastry cream and Italian rainbow cookies, which are basically super moist and jammy almond cakes with a dash of chocolate. Each spoonful was like a bite of cake and ice cream, with a dash of citrus here and there. Give it a try! I promise you won't regret it. Molly includes a recipe for homemade Italian rainbow cookies, but they're on literally every corner in New York and I was lazy sooooo I bought some. You can too (online)! 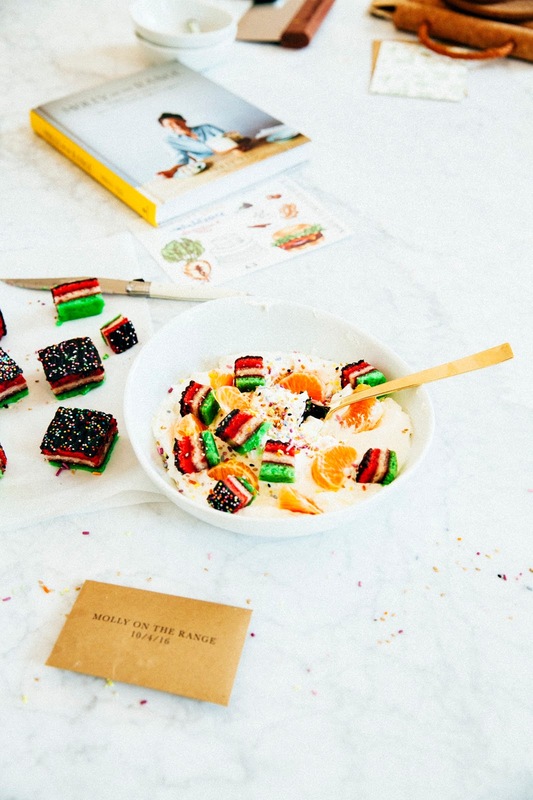 In a pinch, you can also use other cookies, but to get the full Molly Yeh cookie salad effect make sure that you use a spongey or cakey cookie. In a medium saucepan, whisk together 2 tablespoons all-purpose flour, 1/4 cup granulated sugar, and 1/4 teaspoon kosher salt until well combined. Whisk in 2 large egg yolks, then whisk in 1 cup of heavy cream. Heat the mixture over medium heat, whisking constantly, until it thickens to a pudding-like consistency and can coat the back of a spoon. Stir in 1/4 teaspoon almond extract, and transfer to a bowl. Cover with plastic wrap, pressing the plastic wrap directly against the surface of the cream. Refrigerate for at least 1 hour, but preferably overnight. When you're ready to serve the dessert, place the remaining 1 cup heavy cream in the bowl of a freestanding electric mixer fitted with a whisk attachment. Beat on medium-high speed, until stiff peaks form. Fold the whipped cream and chilled pastry cream (from the 1st step) together. 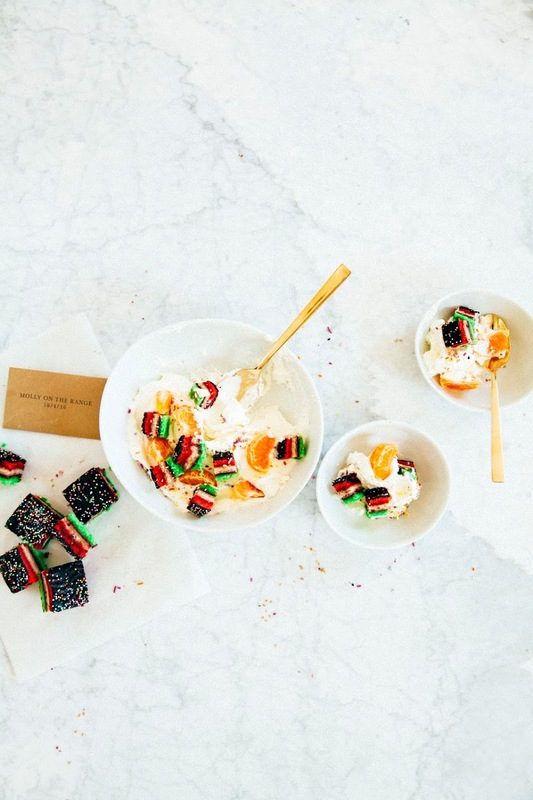 Set aside a few clementine segments and Italian rainbow cookies for garnish. Gently fold the remaining clementine segments and cookies into the cream mixture. 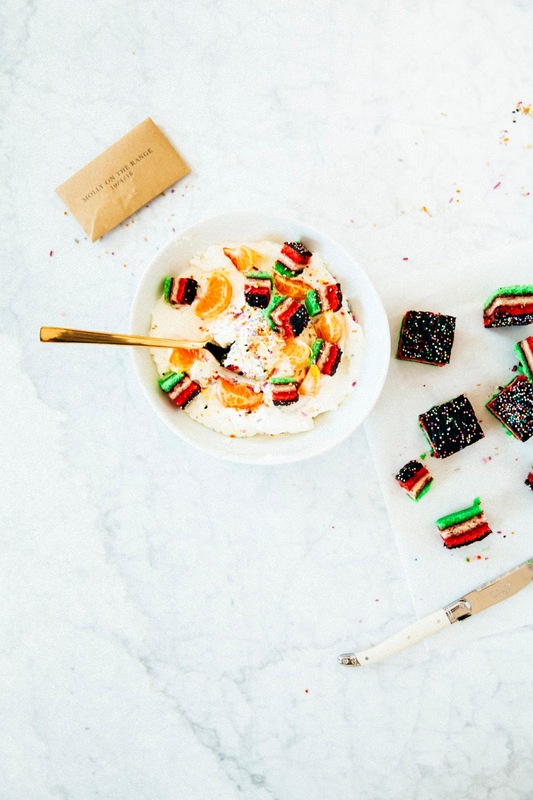 Top with the remaining clementine slices and cookies and serve immediately. Enjoy!